Emma Tutton (University of Bradford) at the top of a cistern in the House of the Triclinium. Water would have been drawn up through the head of the cistern using a bucket. Andi Lowe (University of Notre Dame) cleaning an industrial tank lined with waterproof plaster. Although we think that such tanks may have been used for making the fish sauce garum, whatever the process was here, it's certain that it involved large quantities of water. A waterproofed channel ran along the south side of the dining space in the House of the Triclinium. Water flowing through it provided coolness and pleasure for the diners, and perhaps a reminder of a great river to match the Nilotic paintings that were in the room. From left Alvin Ho (Columbia University), Kirk Norman (University of Maryland), Roz Ward (Bradford Girls' Grammar School, Foster Beaver College, UK). The southern end of insula VI,1, showing first the public fountain, and behind it the well, with the Via Consolare to the left and the Vicolo di Narciso to the right. Tory Tellefsen (University of Wisconsin) excavating a surviving length of lead water pipe. Photos courtesy of the AAPP. Water was just as essential to the ancient Pompeians as it is to us. They used it differently of course, but they still needed it. Its supply became increasingly critical as the city's population increased and became ever more densely packed within the walls. The famous aqueduct builders of the Roman world brought water to Pompeii in its turn, but the system that provided the public fountain at the southern end of VI,1 had only been in operation for about 70 years by A.D. 79. Our work has shown the complex strategies that the people of VI,1 adopted to ensure they kept themselves supplied with water. We have discovered cisterns for storing water, pipes for carrying it for use, and drains for taking it away. We can show how it was used for domestic needs, for industrial uses, and for show. The first and most obvious source of water is rain. Throughout its history the people of Pompeii channeled rainwater and stored it in underground cisterns, which acted as settling tanks and coolers. We have now found underground cisterns in every property throughout the insula. Despite the fame of the aqueducts to modern audiences, cool and fresh water from such cisterns was preferred for domestic use. Even the grand inhabitants of the House of the Vestals did so, using their complicated piped water systems from the aqueduct only for display fountains and gardens, and the bath suite. The industrial activities in VI,1, whether the below-ground tanks or blacksmithing, the processes needed abundant water and we have found the traces of how it was used and where it came from. The most extensive features are the group of tanks in the so-called Soap Factory. Here there were at least five linked tanks, and in the middle was a well. Water used for display was an important part of showing off status and wealth. This was particularly true of the House of the Vestals. No other property in the insula seems to have taken piped water from the aqueduct pipe in the first century A.D., but it used it for several fountains, a bath suite, and a swimming pool. Elsewhere, water features were created in the inn, as in the triclinium space, but they used cleverly managed rainwater to create their effects. When modern visitors approach VI,1 from the direction of Pompeii's forum, like their ancient predecessors, they first see the public fountain, which is like so many around the streets of the city. But behind it is a rarer feature: the imposing structure of a wellhead. Thanks to our excavations around it this summer, we can now unravel its story. Its shaft is massive, some three meters by four in section and we don't know its depth for certain, through probably at least 30 meters. This was an enormous job of engineering. It must have produced a spoil heap that dwarfed our own. It's possible that some of this heap was spread over the area north of the well before any buildings were constructed. It now seems clear that the well was one of the key stages at the beginning of the development of this part of the insula, intended to supply the new industrial properties being planned. Our excavation has shown that this all took place in the second century B.C. We can now see it not just as an effort to provide more water, but as part of a comprehensive redesign of this part of the city. Its date seems quite late, a little more than two centuries before Pompeii's destruction, but fits with other new evidence now growing from around the city. If this season's work has given us a new appreciation of other water engineering, we mustn't neglect the aqueduct. It came to this part of the city in the beginning of the first century A.D., to the fountain at the junction of the Via Consolare and the Vicolo di Narciso. The well shaft was probably filled in then. 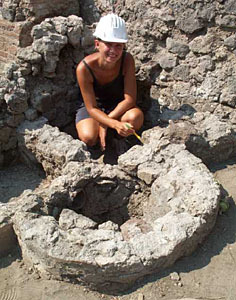 Very often in Pompeii we find that the lead pipes that carried the water have been removed, mostly by the early modern excavators. We can trace where they have been, but no more. This season we found the real thing. Around the fountain most of the piping had gone, as usual. We could see how it had come down the Vicolo di Narciso from the north, where it had been led up a water tower, and then to the fountain. We could even see where a branch had been taken to the west across the Via Consolare for the houses there. All this came from finding the traces of where the pipes had once been. Then, just at the edge of the stone paving of the Vicolo di Narciso, we exposed a length of about half a meter of actual lead pipe. It was a branch that had been taken across the street towards the House of Sallust. It looks like the paving stones here were too much for whoever ripped out the rest of the pipes and they left the lead. However we need water, we use it and then have to get rid of it. Maybe it's dirty from use, maybe there's too much overflowing a cistern after heavy rain. Nowadays, when it rains in Pompeii, it pours. In the ancient city people were just as ingenious in finding ways to dispose of unwanted water as they were of collecting it in the first place. Insula VI,1 is full of drains that took water away, usually to flow off down the street. They were hidden away under floors and couldn't be seen. These drains dealt with overflowing water of one kind or another--rainwater or from fountains. It didn't carry away rubbish or foul material. Nevertheless drains have proved very rich locations for discovering small bits and pieces of debris, like fish bones or eggshell, that were washed into them either from rain storms or from washing floors. We like digging drains. 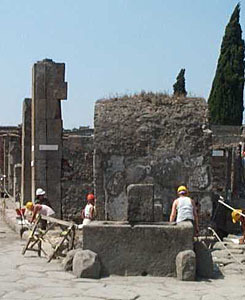 For eight years now, the Anglo-American Project in Pompeii has studied the full history of development of one city block, VI,1. When was there first activity here? What was this activity and how did it change over time? These last five weeks, we have investigated industrial and commercial areas. What were people doing? making? selling and buying? Were these areas always commercial and industrial? When did mercantile enterprise first appear in VI,1? After these five weeks, we are able to answer many of these questions. VI,1 provides plentiful evidence for industry and commerce both at the moments of Pompeii's sudden interment in A.D. 79 and for more than two centuries before. The key changes took place during the second century B.C. An early part of this development was the cutting of a deep well at the southern point of the insula. This provided a substantial public water supply. Then at both south and north ends of the insula industrial properties were built. The northern wall of what later became the inn was constructed on the edge of the third-century B.C. earthen ramparts, defining an extensive area of industrial activities. Associated with this phase are several deep tanks lined in waterproof plaster. These tanks appear throughout the entire insula: in areas that later became the bars (both northern and southern), the entrance to the inn and the "soap factory." The fills of some of these tanks contained a high concentration of fish bones and scales, and the northernmost tank contained a fully articulated fish skeleton. These discoveries suggest that the tanks were used for processing fish. Subsequent analyses of residues within the tanks' lining will help us test this preliminary hypothesis. The tanks seem to have been destroyed after Sulla's assault in 89 B.C., when the northern range of the insula suffered severe damage. Structures just to the south of the city wall were leveled to their foundations, and new walls were built immediately above. After this, smithing became an important industrial activity in VI,1. Hearth bottoms and thick deposits of hammer scale and slag attest the earlier presence of blacksmiths in both of the areas that later became the "soap factory" and the entrance to the inn. In its final phase, the insula's commercial activity is almost entirely related to food and hospitality: four bars, an inn, and an elite dining area. These various areas catered to a wide range of customers, from the visitors grabbing a bite to the traveling trades people checking in for a night's rest to small gatherings of wealthy clientele reclining over a fancy dinner party. The only sign of industry in VI,1 at the time of the eruption is the so-called soap factory, which dealt in some sort of manufacture using water. We have discovered how the character of the insula was created in the second century B.C. : a clear separation of the residential and the commercial and industrial. This distinction--both in function and in physical space--carried through two centuries to the moment of Pompeii's destruction in A.D. 79. The second century burst of construction brought industry and commerce. This part of the city's history, then, is fairly short but extremely fast-moving. There were many subsequent changes of detailed organization, in both residential and commercial space, but the cityscape of Pompeii was defined in the second century B.C. Our five-week excavation season has ended. The deep trenches have been backfilled, but the research and investigation continues through the rest of the year. Ecofact samples, including tank sediments and human excrement, will be analyzed in University of Bradford laboratories for further information about Pompeian industry and diet. All documentation surrounding the excavation will be carefully reviewed in our hunt for the sequence of development of VI,1. The ultimate goals of all this work remain understanding the ancient better through the tools of modern archaeological research, contributing to the preservation of the monument for future generations, and the communication of all this through publication. The Anglo-American Project is committed to publishing in a full variety of forms, not just academic papers and monographs. This past summer, we have been able to talk over our work and discoveries at the trench-side, face to face with tourists from round the world. And with you the Internet audience, our remote visitors, we have shown yet more of our work here in VI,1. We hope you have enjoyed sharing our season's reflections and discoveries as much as we have!